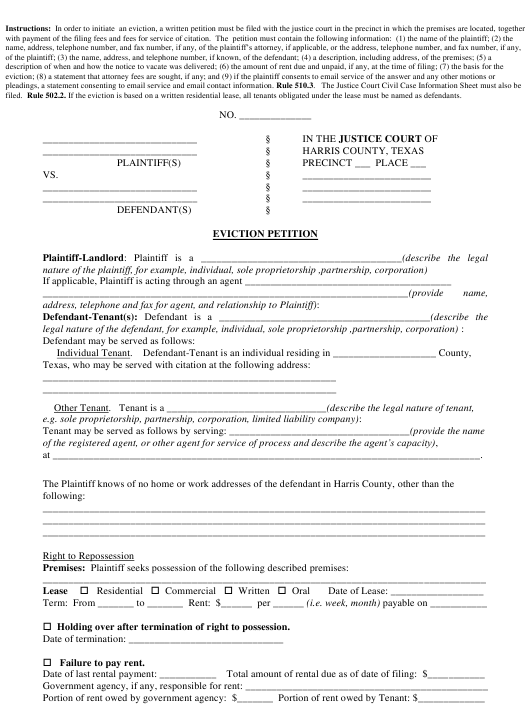 This Texas-specific "Eviction Petition Form" is a document released by the Texas Courts. filed. Rule 502.2. If the eviction is based on a written residential lease, all tenants obligated under the lease must be named as defendants.  Holding over after termination of right to possession.  Failure to pay rent. fees, as applicable, and all costs of court, and general relief. Plaintiff consents to e-mail service of pleadings and notices to the following e-mail address. SWORN TO before me on ______________________.